Will Michael whine about the wording of one question and for another 1,000 bonus points, which one will he whine about? Who will be the final winner of this TAR game? From which current position(range) will the final winner come from? 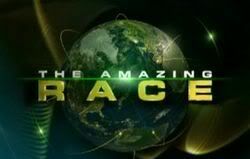 100 points - Who wins the Amazing Race? 50 points - Which team is second to the finish line mat? 25 points - Which team comes in third at the finish line mat? 15 points - Which team arrives at the *first* Road Block first? 15 points - Which team arrives at the *last* Detour first? 15 points - Which team member completes the *first* Roadblock first? 15 points - Which team completes the *last* Detour first? 15 points - Which team member completes the *first* Roadblock last? 15 points - Which team completes the *last* Detour last? 10 points - Will Phil be wearing any sort of jacket/coat at the finish line? 10 points - Do we hear mention of Ron's Hernia at any point during the race? 10 points - Is it a foot race to the finish line? Yes! It's a nail biter! 10 points - Will the winner's get to call home with a phone? Yes, yet another corny ending. 20 points - Which eliminated team do we see first at the finish line? No single team is shown first, more than one of the above. 25 point bonus - 57 people signed up to play this game, how many will actually make their picks for the final episode? 25 point bonus - Which of these teams has the very last confessional at the end of the show? Wow that's a massive 375 points up for grabs, its so random that probably anyone in the top 10 can win this one and anyone can win this final week. It's going to be interesting in the final score and positions and the question thats worth 100 points is probably the most important question ever in the race. Should I go with my heart or gut? You are so evil. I will never win with this many points possible. Hell Ken could even win. I went with my gut and that is the obvious Rachel and TK win since they are the youngest and the fastest. I am voting right now, and I can't make up my mind. and My Brain says Tk & Rachel. Based on what we know its possible that the roadblock (ala season's 8 and 9) might be exceedingly near the Pit Stop. If so then its just who finishing the roadblock first. And that literally could be anyone. After all the producers make no secret about it, they want a close race. They absolutely don't want a one sided race, so they will plan out legs which enable teams to be very close (unless they make large errors). And with the roadblock appearing after the detour, its anyone's game. yeah, rachel and TK are the obvious choice but im so confused! IA with your gut puddin! as long as it's YOUR gut. I actually don't care who wins but it would be cool to see some history made. Yeah that! I hope it's Nick n' Don, not only b/c I really like 'em, but for once, may an OLD person win!! No oldster has ever won TAR! I think Don is older than Ron, but even if Ron/Chris win, ok with me. If TK/Rachel win...that's also good, just cuz I like them too! It's great to FINALLY have a F3 who are ALL purdy dang likeable! Good Luck with the game, Everyone! Ron hernia? I didn't hear anything so agree or not? so how many people played!?? MSWOOD!!!!!!!!!!! WTG mwood!!!!!!!!! Good Job!!!!!!!!!!!!!!! after bombing out these past couple of weeks I've managed to finish in the top 3!! woohoo!! Finale Highest score ...mcrone you are TEAM #1!! Good job! Great score!! this game was fun ! As the winner of the Overall leader board I'd like to present you with a trophy -- ENJOY!! THAT is what we've been playing for!?! how dare you trick us like that you shiester! Don't be jealous mcrone because you are also a winner! !